Living rooms incorporate shelving units that articulate the need for stylish storage solutions. Each of these three spaces incorporate Rakks Shelving that plays a supporting role in storing books, vinyl records and picture frames. 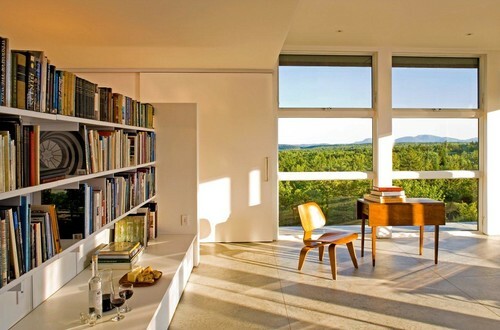 The first residence has a tremendous minimalist living room overlooking a Maine hillside that is opposite to Frenchman Bay and Acadia National Park. Next we detail a family room from the Gulf Coast in New Orleans. 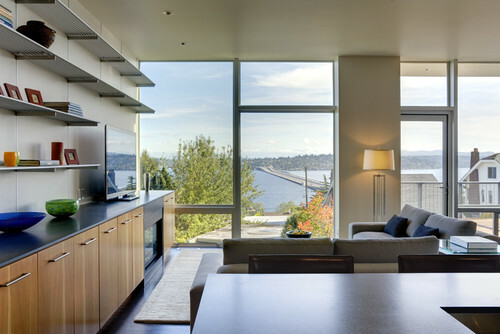 Lastly, a seaside living room adjacent to Downtown Seattle. Staying with a modern, minimalist theme while using traditional New England building elements (such as white cedar shingles on the exterior), Peacock Builders of Bar Harbor was able to create this alluring living room. Acting as a bookshelf, the shelves are supported by Rakks Style Brackets, allowing ample storage space in the living room. Books and art objects are proudly displayed on the shelving system, allowing enough space for the rest of the room to open up to the outdoors. This Gulf Coast living room has a cozy corner at ground level. 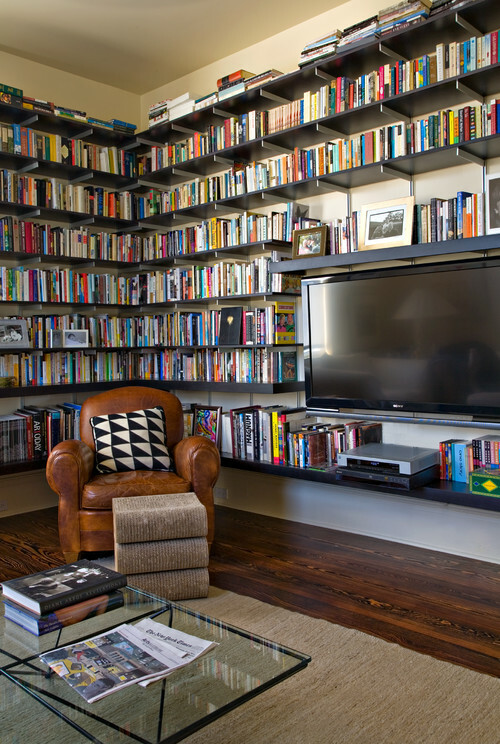 Eight levels of Rakks Brackets hold custom shelves that frame an entertainment system. The dark shelving combined with warm, dark-wooden flooring and a brown leather chair help combine contemporary and mid-century elements to make a stunning statement from floor-to-ceiling. This Pacific Coast living room overlooks Lake Washington’s Lacey V Murrow Bridge and Downtown Seattle. In this instance, when combined with floor-to-ceiling views, the Rakks Aluminum Shelves bring the focus of the room up and outwards towards the fantastic panorama. Rakks Brackets and Shelves play to the spaces strengths – clean lines and modern styling.